This three day intensive trainer accreditation programme will give you the practical tools and techniques used to deliver effective Adair ‘Action Centred Leadership’ training. 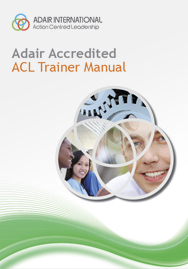 On completion you become an ‘Adair Accredited ACL Trainer’. There are three levels of accreditation - Team, Operational and Strategic. HR / Training Managers who want to develop their understanding of the John Adair approach to leadership training. This would allow them to integrate the approach into their management and leadership development programmes. In–company trainers who could then deliver Action Centred Leadership with confidence as part of their role and personal development. Consultants and freelance trainers who would like to develop and enhance their understanding of the model and deliver the Adair Action Centred Leadership course to clients. You will receive a copy of the official Adair Leadership Trainer’s Manual (worth £500 + VAT). Not only will this reinforce what you have already experienced on the course, but will provide the material for any future course that you present. Learn to train with practical exercises devised to illustrate each key learning point. Understand how to develop the programme and meet both individual and organisational needs. Receive a thorough grounding in Adair principles and techniques. Be able to use ‘Adair Accredited ACL Trainer’ in your own advertising if appropriate.